China National Petroleum Corporation (CNPC) (simplified Chinese: 中国石油天然气集团公司; traditional Chinese: 中國石油天然氣集團公司; pinyin: Zhōngguó Shíyóu Tiānránqì Jítuán Gōngsī) is a Chinese state-owned oil and gascorporation and the largest integrated energy company in the People’s Republic of China. 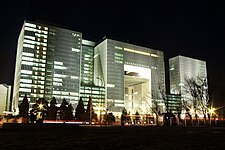 Its headquarters are inDongcheng District, Beijing. CNPC is the parent of PetroChina, the fourth largest company in the world in terms of revenue as of July 2014. CNPC is the government-owned parent company of publicly listed PetroChina, which was created on November 5, 1999 as part of the restructuring of CNPC. In the restructuring, CNPC injected into PetroChina most of the assets and liabilities of CNPC on its hydrocarbon exploration and production, refining and marketing, chemicals and natural gas businesses. CNPC and PetroChina develop overseas assets through a joint venture, CNPC Exploration & Development Company (CNODC), which is 50% owned by PetroChina. In March 2014, CNPC chairman Zhou Jiping announced that CNPC would be opening six business units to private investors. Unlike Chinese Petroleum Corporation, which was ceded to Taiwan with establishment of the Republic of China, CNPC can be traced from the beginning as a governmental department of the People’s Republic of China government. 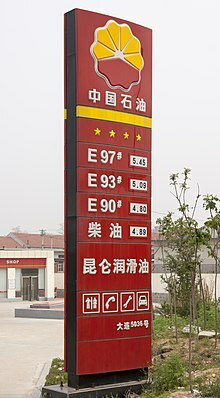 In 1949, the Chinese government formed a ‘Fuel Industry Ministry’ dedicated to the management of fuel. In January 1952 a division of the fuel ministry was formed to manage petroleum exploration and mining, called the ‘Chief Petroleum Administration Bureau’. In July 1955 a new ministry was created to replace the Fuel Industry Ministry, called the Ministry of Petroleum. From 1955 to 1969, about 4 oil fields were found in 4 areas in Qinghai, Heilongjiang (Daqing oilfield), Bohai Bay and Songliao basin. CNPC was created on 17 September 1988, when the government decided to create a state-owned company to handle all Petroleum activities in China and disbanded the Ministry of Petroleum. CNPC’s international operations began in 1993. The CNPC subsidiary SAPET signed a service contract with the government of Peru to operate Block VII in theTalara Province basin. This was followed[when?] by an oil contract with the government of Sudan to manage Block 1/2/4 in the Muglad oilfield. In August 2005 it was announced that CNPC agreed to buy the Alberta-based PetroKazakhstan for US$4.18 billion, then the largest overseas acquisition by a Chinese company. The acquisition went through on 26 October 2005 after a Canadian court turned down an attempt by LUKoil to block the sale.In 2006 67% of shares were sold from the parent company to PetroChina In June 1997, the company bought a 60.3% stake in the Aktobe Oil Company ofKazakhstan, and in July 1997 CNPC won an oil contract for the Intercampo oilfield and East Caracoles oilfield in Venezuela. In July 1998, the government restructured the company in accordance with the upstream and downstream principle of the oil industry. and CNPC spun off most of its domestic assets into a separate company, PetroChina. On 5 November 2007, HK listed PetroChina was listed as an A share in the Shanghai Stock Exchange. In July 2013, CNPC and Eni signed a $4.2 billion deal to acquire a 20% stake in a Mozambique offshore natural gas block. In June 2014, the “head of a key China National Petroleum subsidiary was recalled to Beijing” and fell “from public view”. Replacement of China National Petroleum’s top representative in Canada was announced in July. CNPC holds proven reserves of 3.7 billion barrels (590,000,000 m3) of oil equivalent. In 2007, CNPC produced 54 billion cubic metres of natural gas. CNPC has 30 international exploration and production projects with operations in Azerbaijan,Canada, Iran, Indonesia, Myanmar, Oman, Peru, Sudan, Thailand, Turkmenistan, and Venezuela. The exploration projects, both domestic and overseas, are run by a wholly owned subsidiary, the Great Wall Drilling Company (GWDC). CNPC operates in New Zealand as CCDC NZ Drilling and has one rig, a triple stand DC rig named Rig 43. CNPC (CCDC NZ) started work over/drilling operations in the Kapuni gas fields of South Taranaki New Zealand in late 2012 for “tight gas”. The rig completed the Kapuni drilling campaign of 4 wells for STOS (Shell Todd Oil Services) in August 2013. Its next drilling project commenced August 2013 for Tag Oil with one well successfully drilled at Cheal C of a depth of just under 5,000m. The rig is currently awaiting decisions for appeals for the next stage of a drilling campaign for Tag Oil and is currently not operational during this period, with maintenance operations being carried out. In March 2009, CNPC began development of Ahdab, an oil field in Wasit Governorate holding a modest one billion barrels, becoming “the first significant foreign investors” in Iraq. The project progressed despite security problems with local farmers. Dozens of farmers complained of damage to property because of work on the site and Iraqi oil officials claimed thievery from the oil site by local farmers. Adhab is not expected to be a major profit center, earning the company a projected 1 percent profit, but the field was seen as an entry strategy into Iraq. Following Adhab, CNPC obtained a production contract during the 2009/2010 Iraqi oil services contracts tender to develop the larger “Rumaila field” with joint venture partner BP, which has an estimated 17.8 billion barrels (2.83×109 m3) of oil. It is expected that crude oil production from Rumaila will expand by 10% by the end of 2010 once the BP PLC/CNPC consortium takes over development of the field in June 2010. A contract was also awarded to a consortium led by CNPC (37.5%), including Total (18.75%) and Petronas (18.75%) for the “Halfaya field” in the south of Iraq, which has an estimated 4.1 billion barrels (650,000,000 m3) of oil. CNPC became increasingly involved in development of Iranian oil fields following Western sanctions that targeted the Iranian oil and gas sectors leading many European energy companies such as Shell Oil, Repsol, and etc. to shut down operations in Iran. The CNPC along with Sinopec has been involved in various projects relating to Iran oil/gas development. As of 2011, CNPC has been developing Iran’s age-old Masjed Soleyman Oil Field, the oldest oil field of the Middle East, together with Iranian counterpart NIOC in a deal worth 200 million dollars. Production from this particular oil field was expected to increase in 2011 from 2,500 barrels (400 m3) a day to 25,000 barrels (4,000 m3) after the completion of the first phase, and to 55,000,000 bbl/d (8,700,000 m3/d) after the completion of phase 2 of the project. CNPC with Indian state oil firm, ONGC created a joint venture to acquire minority stakes ranging from about 33.3% to 38% in several mature Syrian oil and natural-gas properties. The combined entity was a notable instance of cooperation between two state oil firms that regularly competed for assets around the world. CNPC is heavily involved in the development of Kazakh oil after the acquisition of Alberta-based PetroKazakhstan, a company with all operations in Kazakhstan. The company was purchased for $4.18 billion. Political resistance in Kazakhstan to the deal was placated by the sale of a minority stake in PetroKazakhstan by CNPC toKazMunaiGaz, the Kazakh state-owned oil company. In 2006, CNPC formed an international consortium with state-run Uzbekneftegaz, LUKoil Overseas, Petronas, and Korea National Oil Corporation to explore and develop oil and gas fields in the Aral Sea. In October 2004, CNPC began construction of a pipeline from the Middle East to Xinjiang. In December 2011, Afghanistan signed a deal with CNPC for the development of oil blocks in the Amu Darya basin, a project expected to earn billions of dollars over two decades; the deal covers drilling and a refinery in the northern provinces of Sar-e Pol and Faryab and is the first international oil production agreement entered into by the Afghan government for several decades. CNPC has been a major investor in South Sudan‘s oil sector. In May 2014, A 30-year deal between Russia‘s Gazprom and China National Petroleum Corporation (CNPC) which was 10 years in the making was estimated worth $400 billion. The agreement was signed at a summit in Shanghai and is expected to deliver some 38 billion cubic meters of natural gas a year, starting around 2018, to China‘s burgeoning economy. On 23 December 2003, a gas blowout occurred at the Luojia No. 16H gas well. 243 people died, 2,142 were hospitalised. In 2005, there were explosions at a CNPC owned petrochemical plant causing six deaths, a mass evacuation, and a massive oil spill over the Songhua River. A gas pipeline exploded on 20 January 2006 in Sichuan. Reportedly, nine were killed and nearly 40 injured. A leak occurred on 25 March 2006 in the Luojia No. 2 gas well. The third attempt six days after the blowout succeeded; 15,000 were evacuated. In 2009 a CNPC pipeline burst, spilling 150 m3 (5,300 cu ft) of diesel oil into the Chishui River in Shaanxi province. In July 2010, two pipelines exploded at an oil storage depot belonging to China National Petroleum Corp near Dalian’s Xingang Harbour in Liaoning province which spilled an estimated 1,500 tonnes of crude into the sea. The worst of the spill initially covered 180 km2 (69 sq mi). The operations of a CNPC subsidiary in Chad were entirely suspended in August 2013 by the country’s government after it violated environmental standards while drilling for crude oil in the south of the country.